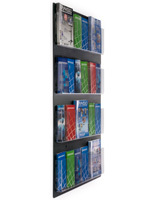 This wall mount brochure holder provides businesses with a means of offering literature to customers in a neat and organized manner. 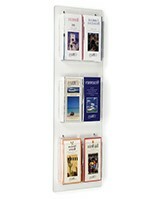 Place this hanging literature rack in a waiting room to allow patrons to read while they are waiting to be seen. 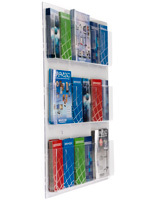 A wall mount brochure holder, such as this magazine rack features six acrylic pockets that can be separated into a maximum of twelve smaller pockets. 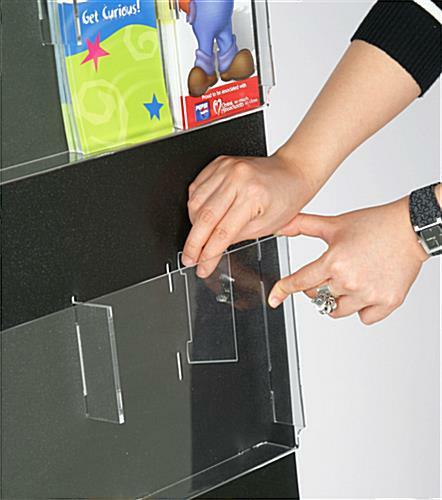 The black plastic backer provides a neutral background for the inserted flyers and pamphlets. 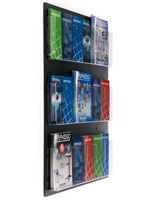 This mounted literature display, wall mount brochure holder is simple to maintain and change at a moments notice. The included dividers simply snap into place within each pocket. 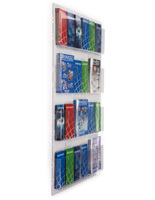 This wall mount brochure holder, also called a flyer organizer can accommodate six different 8-1/2" wide magazines or up to twelve 4" wide pamphlets. Users can choose to create a custom look by using any number of the dividers. 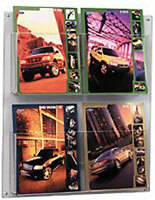 Each wall mount brochure holder ships completely assembled; ready to hang right out of the box. The black plastic backboard has a pre-drilled hole in each of the four corners to allow for easy mounting. 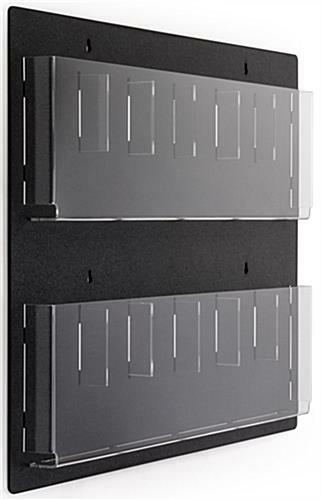 This wall mount brochure holder includes the necessary screws and anchors for installation. 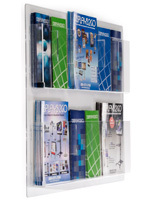 The clear acrylic pockets provide an unobstructed view of the entire magazine or literature on display. 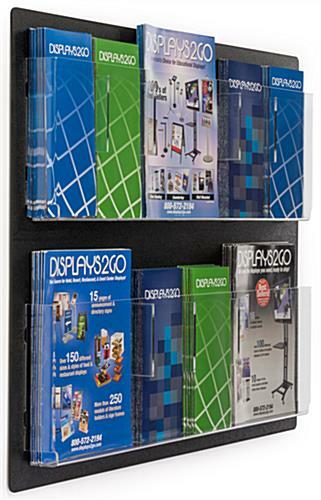 This wall mount brochure holder has pockets that are high enough in the front to minimize single-sheet flyers from flopping over or bending. Likewise, pamphlets will remain upright in these clear pockets. 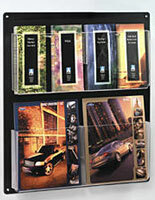 This wall mount brochure holder is manufactured here in the United States! Here is what they look like mounted! Fits our needs perfectly! Fits perfectly in the space we needed it for. Comes already put together, just have to mount it on the wall. Love that it comes with adjusters to be able to customize the sizes of brochures you may have. Overall great product. Exactly what our nonprofit was looking for - reasonably priced, easy to mount, and versatile product that can be changed to fit our needs. It looks great on the wall and serves our purpose well! We're so glad we had just what you needed, Ryan! Thanks so much for taking the time to review and send us a photo! Works great. Perfect size for our location. Nice that you can adjust the size of the slots for several sizes. Thanks for the great review and taking the time to send us a photo, Brent! We're so glad this lit rack works so well for you. We are enjoying our new brochure holders in our office. They were definitely of better quality than I thought they would be. We have them hanging in our exam rooms. This is our first time ordering from this company and we would order again if we needed to. We're so glad to hear these worked well for you and you'll be shopping with us again, Valeri! Thanks so much for taking the time to review.